Here's a version that's lost its Edge, so to speak. I bought a copy of (Ahk-toong Bay-Bi) Covered a few weeks ago; as its name suggests, it's a collection of covers of all the songs on U2's Achtung Baby, to benefit famine relief in east Africa. It also includes a bonus: a remix of U2 itself, with a pretty new take on Even Better Than The Real Thing. Instead of the opening tears and rips of The Edge's guitars, we hear keyboards dominate the mix. The guitars come in later, but by then we're into what's pretty much a different song. I like it, and have been playing it a lot on walks lately. The rest of the album (with contributions from Patti Smith, Jack White, The Killers and many more) is pretty decent, too. "It's written in rock and roll that all you need is love. But you also need a great nose." Lisa: I haven't seen you at school. C: Just moved from Ireland. My dad's a musician. L: Is he ... ?? C: (interrupting) He's not Bono! A second U2 video post within a week or so ... and also AIDS-related. U2 has covered Greg Lake's over-the-top seasonal standard as part of the new online magazine (Red)Wire, which is part of the (Red) campaign to tackle AIDS in Africa. (Red)Wire's first issue is released today. Subscribers get downloads that, evidently, work with iTunes. Not my favourite song, but I'll tip my hat to The Edge for some pretty cool playing. In 1990, Red Hot + Blue was released - a pretty solid collection of covers of Cole Porter by a whole slew of famous folks. Remarkably, a video was made for almost every single, with a TV special airing on this date, 18 years ago. It was a bit of an event. Martha and I visited friends and the four of us huddled around the TV, passing comment as the songs went by. The range of tunes was was pretty wide, from the sombre images of k.d. lang caring for an unseen loved one to Neneh Cherry's dark, if not menacing take on I've Got You Under My Skin. Red Hot still exists. In fact, today the lineup for the 20th Red Hot project was released. Dark Was the Night comes out in February, with contributions from Arcade Fire, The National, Sufjan Stevens, New Pornographers and many more. It's good to know that artists as vital to their time are involved, in much the same way as the original bunch. Speaking of which: U2 took on Night and Day for Red Hot + Blue. The video is by Wim Wenders, but looking back, it's the sound that sticks out. You can see, or hear, where U2 would be going for much of the next decade. As it's World AIDS Day, here it is. A new Dean Martin passed by this month, and of course I thought it was a compilation of old recordings. Well, sort of. Dean Martin with Big Bad Voodoo Daddy: Who's Got The Action?. The album Forever Cool takes Dino vocals and marries them to newly recorded duets, with vocals from an assortment that includes Joss Stone, Kevin Spacey, Charles Aznavour and Shelby Lynne. This is the track that caught my attention the most: a new backup from retro-minded swingers Big Bad Voodoo Daddy. Mary Barry: Hurricane Charley. From her new album, Red Eye Tonight. Spot-on lighter jazz for winding down. 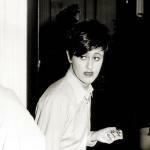 Tracey Thorn: Plain Sailing. Twenty-five years old, and still fresh: a song about "meetings arranged" that in this case did work out. Three Dog Night: Black & White. A No. 1 from 1972, with an optimistic take on race relations that seems to fit the time. I didn't know until recently that the song dated from the mid-1950s, when things were very different indeed. I post a playlist of five tunes each Saturday; click on the link below to see more. The Joshua Tree was, as I recall, the last great album I bought on vinyl. In fact, I held off buying a CD version for many years, and - in true snobbish style - felt that the moody opening of Where The Streets Have No Name ought to be played through a stylus, to get the real effect. Click here to hear, read and view material about the Joshua Tree from U2's site. A generous gift certificate has brought some new music into the house: new entries from U2 and Rufus Wainwright, and Paul Weller's acoustic set, Days of Speed. The last one has been the most played so far. I was curious to see that both U2 and Wainwright included generous DVDs (a full live concert in the latter case) with the CDs, indicating either a way to lure fans to spend money on actual discs, or a marketing shift that adds value to the whole package. U2's disc, after all, consists largely of promo videos that are given free to networks ... the problem being that even MTV hardly plays music anymore, and not aging rock bands at that. And speaking of Rufus ... Mr. Wainwright has dropped out of the Canada Reads program, because of apparent scheduling conflicts. Rats. Hearing him "battle", as it were, for Leonard Cohen would have been worth the trouble of remembering to tune in.